Media & Adventist Benefits – What About Ark-eology? 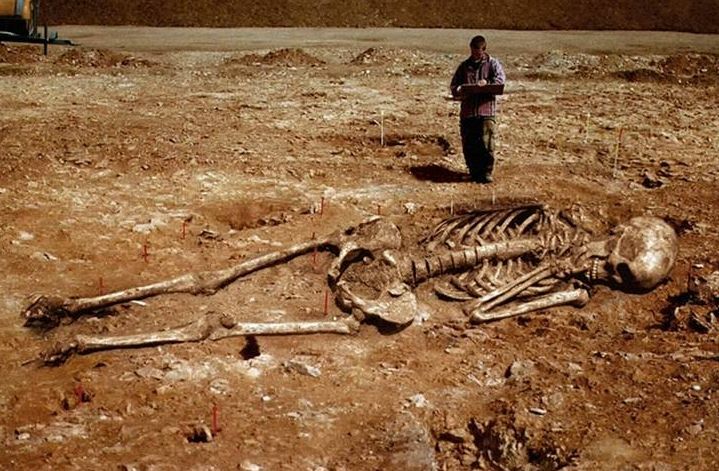 Giant skeletons: amazing discovery or internet hoax? Take the ark of the covenant, for example. There are currently at least a dozen suggested locations for it – from a church in Ethiopia, to Mount Nebo in Jordan, to a cave in Jerusalem. Three of the people or organizations who claim to have discovered it have stated in print that God led them to its location. Yet all three locations are different. The fact that little evidence has been produced seems irrelevant. Videos, images, and books continue to circulate, but in the end, when you look at the evidence, there is very little there. If a professional academic would operate in this way they would be without a job in no time. You cannot make claims without publishing the data and remain credible. Think about it this way. If an archaeologist told me that he had found the cure for cancer and produced a drug treatment, three questions would come to mind: (1) How did the archaeologist find the cure and know he had found it without any medical training? (2) What evidence does he have (lab results, statistical studies of patients cured, etc.)? And (3) can other medical professionals (e.g., the American Cancer Society) verify his claim? Unless these questions are adequately answered, I would not risk my life trying a “cure” based on one person’s claim. Yet somehow when it comes to archaeology, there are individuals with no academic training in archaeology who claim they have found something sensational – Noah’s ark, Sodom and Gomorrah, chariot wheels in the Red Sea, Mt. Sinai – but have produced very little evidence. Faith without any evidence is blind faith. Don’t misunderstand me, anyone regardless of their level of training can find something important. But at some point experts need to verify the authenticity of the find. Take the Bedouin shepherd boy who discovered the Dead Sea scrolls. The boy could not read them or understand their significance. It was up to the scholars to examine the scrolls and translate their texts. For many sensational claims there is often dissemination of the story, but there is no publication of the data or verification by professionals. Until there is evidence and authentication, we can only look at the ‘discovery’ as someone’s claim. Let us return to the question of the giant skeleton e-mails: Are there any institutions or organizations cited? 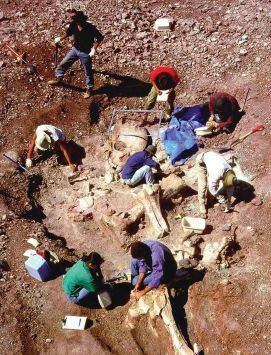 Who are the archaeologists excavating the bones? Where has this information been scientifically published? The e-mail answers none of these questions. Not a single name or authority is cited. It turns out that this e-mail about the “Nephilim” is not new at all. Internet research shows that some years ago a similar discovery was attributed to a National Geographic excavation. National Geographic has since refuted the claim and Snopes has an article exposing this as an internet hoax and confirms that the pictures have all been digitally altered. Clay prism describing Sennacherib’s siege of Lachish in 701 BC. There is no doubt that many credible discoveries have been found that pertain to biblical peoples, places, and events. The names of over sixty individuals mentioned in the Old Testament have been discovered through archaeological research: kings like Nebuchadnezzar, Tiglath-Pileser III, David, and Cyrus the Great. Some appear on seals and others on monuments commemorating battles. Some confirm what many Christians already accept by faith in Scripture but do not determine belief or unbelief. Archaeology remains a limited enterprise. Through records found at Nineveh and excavations at Lachish, archaeology may demonstrate that Sennacherib did indeed destroy the city of Lachish in 701 BC. But archaeology cannot prove that the Angel of the Lord destroyed Sennacherib’s army based on the prophecy of Isaiah. This information comes from the inspired word of God. Archaeology cannot prove a miraculous event. In the end the Bible must stand on its own as a book of faith on these matters. Archaeology’s role is to illuminate the world of the Bible by providing information about how people lived, the buildings they built, the languages they spoke, the religious, social and political institutions they established. Sensational “ark-eology” often requires only short excursions and a few pictures to excite the public. But responsible archaeology has an obligation to work with trained experts in various fields to better understand the past. This takes time and careful investigation. Thank you for your continued support of the long-range planning and research of the Institute of Archaeology, Southern Adventist University. We want to continue to provide reasoned and balanced correlations between Near Eastern archaeology and the world of the Bible.